Although everyone at EatinBrixton greatly appreciates the culinary delights that Brixton now has to offer, it is hard to ignore that these additions to Brixton have come with both perks and downfalls. The rent hikes in the market are beginning to push out those businesses that have been serving the residents of Brixton for years, this fact was even mentioned in a 4 page spread in the Evening Standard magazine a couple of weeks ago – click here to view. Therefore we are starting a new venture for the blog. 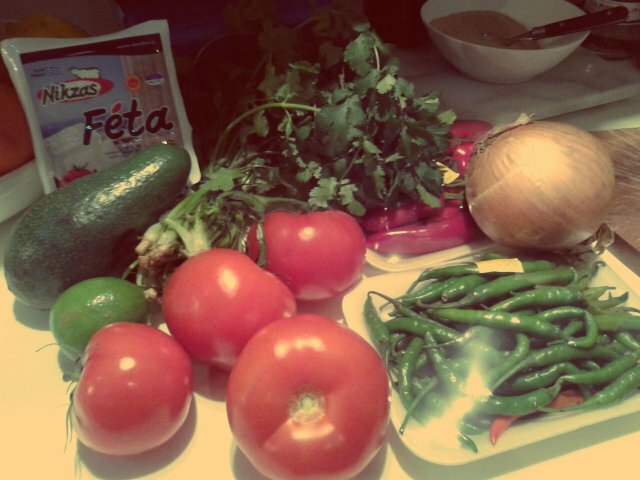 We are giving ourselves the task of trying buy everything (perhaps the majority) for one meal from one local shop. We will lay out the prices, what they had and hopefully promote buying from local independent shops in our beloved Brixton. To begin we start with the one shop that has been spoken about a great deal in the debate of the gentrification of Brixton, Nour Cash and Carry. It’s currently getting coverage on Urban 75 and the Brixton Blog, because it’s facing a significant increase in its rent and service charges, with a petition being promoted in its defence. Basically it sells fruit and vegetables at low prices and a wide range of Caribbean/African/Middle Eastern /Asian foodstuffs. From salted lassi, through to pomegranate molasses, a range of marinades for jerk chicken and palm oil to an impressive range of herbs and spices. If you are into cooking food with powerful flavours, this is the place for you. It’s also a family-run business. The shop has made the most of a rather odd-shaped space. There’s one entrance on Electric Avenue, just a doorway, into a narrow passageway packed on either side with the fresh produce and, usually, jammed with other shoppers. A standout feature here are the large bunches of fresh herbs at a really low cost. 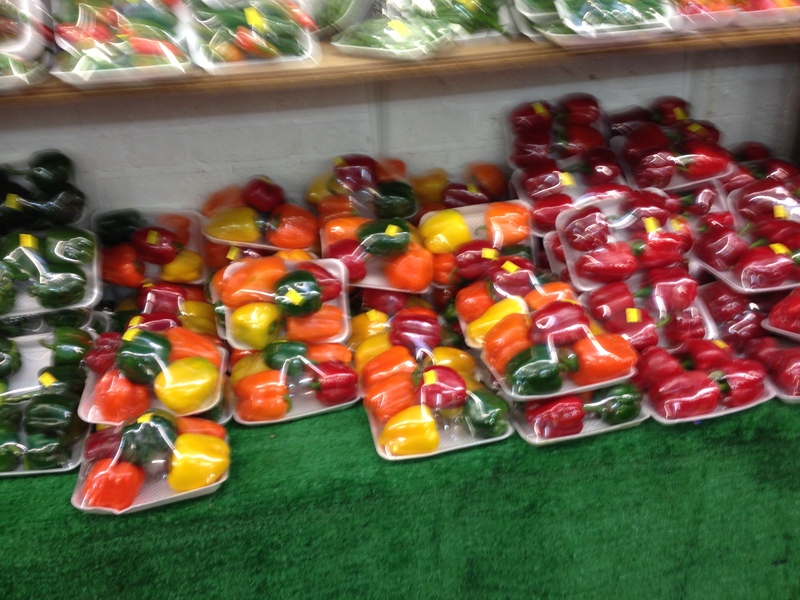 A downside is that much of the fresh produce is sold ready-packed on expanded polystyrene trays wrapped in cling film. The other entrance is a more normal shop-front on Market Row, with a further selection of fruit and vegetables on display. Between them is the main part of the shop, with all the dry goods on display in the closely-packed aisles. There are a couple of chilled units here with milk, yoghurt, etc., with mainly a Middle Eastern background. It’s all a bit chaotic, at least at first glance. Often a degree of patience is required as negotiate your way round the other customers with bulging bags of shopping. Service is usually quick, however, with a number of tills available. And it’s still always a surprise at how little you end up having to pay. 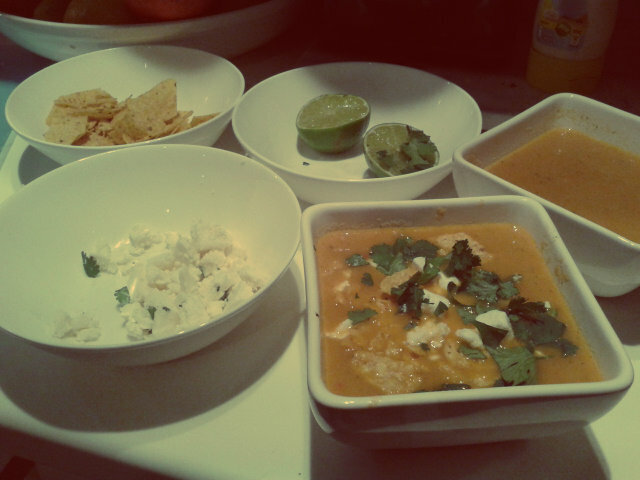 The recipe this time was chosen from the Wahaca recipe book – Roasted Tomato and Taco soup. Whenever I tend to cook there is never any sticking to rules. In this case several things are substituted for others. 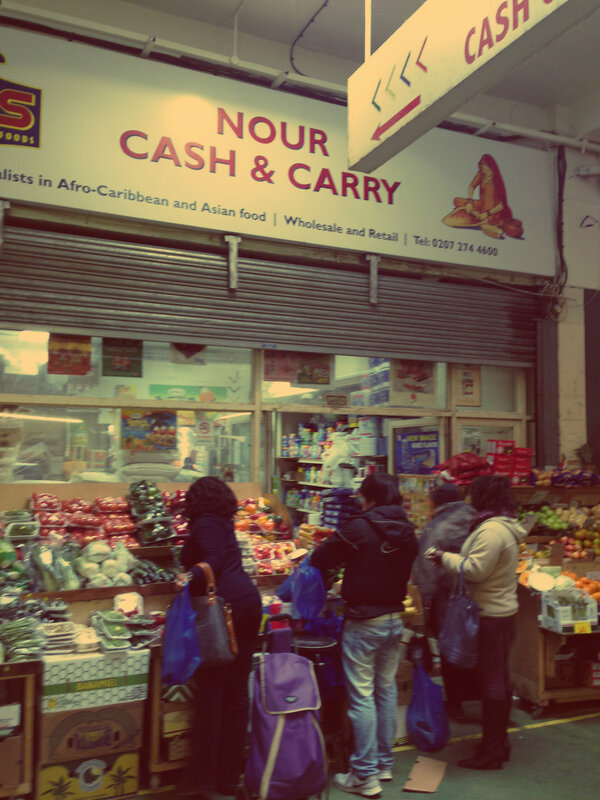 With everything pretty easy to find and cheap fresh vegetables on offer, Nour Cash and Carry is perfect for picking up good quality, cheap fruit and veg. Although I was surprised to find feta cheese there, this may be the only thing I won’t be going back there for as I’m sure you can get fresher feta from A & C Continental on Atlantic Road.